There are many reasons as to why you’d need to anchor your kayak. It could be that you wanted to start your fishing trip, you might want to go for a swim or you might simply just want to relax. What you don’t want to do is start drifting away so it’s important to find the best kayak anchor out there what will keep you still. Here we look at some of the best products on the market to see if we can see what the best kayak sea anchor is out there. So read on and pay attention or you could find yourself suddenly floating down a stream instead of relaxing in your boat! This anchor from best come with a large 40-foot anchor which should be more than enough for your kayaking needs. It gives horizontal drag which could mean a better hold. It will fold up in an easy to use bag which will easily fit inside your kayak. Its four fluke grapple design should easily give you a safe mooring. It’s very simple to use and has a collar that you can just side up to release the flukes and then slide down to keep them in place and you are also protected by a one year guarantee. 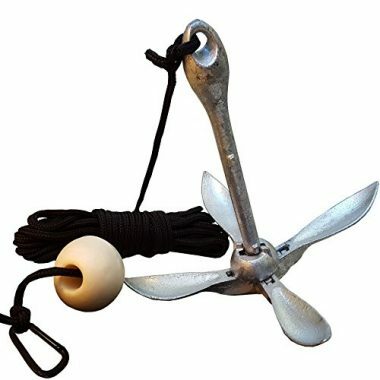 This anchor weighs 3.5 pounds which is slightly heavier than other anchors on the market and comes with a 25-foot rope. The four-pronged anchor folds neatly in a bag for easy storage. It also has an anchor buoy which has a snap hook attached. 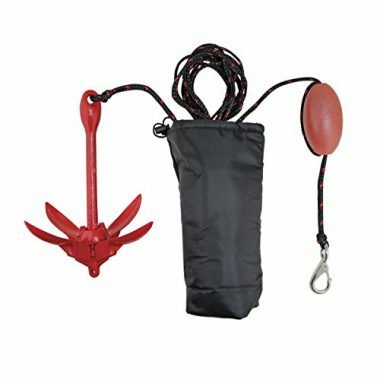 It comes in either painted red or galvanized steel overall this is a simple anchor which will do the job required. This is a 3.3-pound anchor which will hold in any surface that your kayak might be floating over. It has a 4-fluke design like most anchors and will easily fit into almost all compartments. Its rope is marine-grade and has a distance of 25 foot. Its nylon storage case is padded to protect you and stop the anchor from getting damaged. 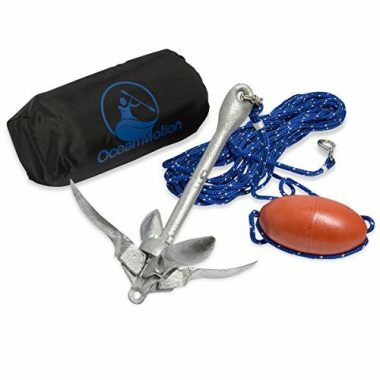 With OceanMotion anchor kit provides you with everything you need to keep your kayak exactly where you want it. Its 40 feet of rope has a reflective tracer on it so you’ll always be able to stop it in low light. The rope is extremely strong and the anchor itself is rust resistant. It easily folds away into a protective nylon bag and also comes with a 2-year warranty. If you’re simply looking for a great anchor, then this model from Extreme Max could be exactly what you’re looking for. 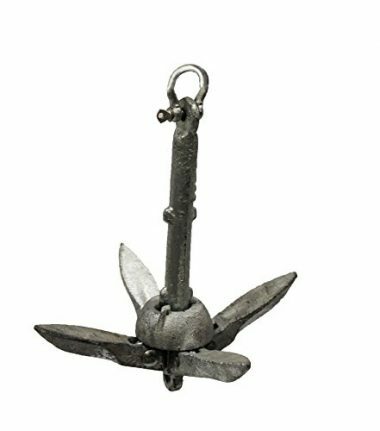 Depending on your needs, this anchor comes in weights ranging from 1.5 pounds all the way up to 13 pounds. It easily folds away into a very small size but doesn’t come with any additional extras. 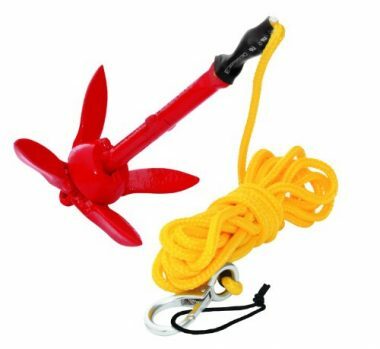 With bright red grapnel anchor with a bright yellow rope is sure to be spotted very easily in any light. That rope though is only 15 feet and the anchor only weighs 1.5 pounds so this would be best for shallower and calmer waters. It has a spring hook and comes with a padded nylon bag which has a D-ring for secure fastening. This anchor comes with a huge 60 feet of rope which sounds great, but may get in the way a little too much if you’re only ever going to be in shallow waters, but could be useful if you’re the type who goes a bit further out. It’s galvanized and comes with the usual folding collar system for the flukes. It weighs 3 pound which should be good enough for most kayak uses. 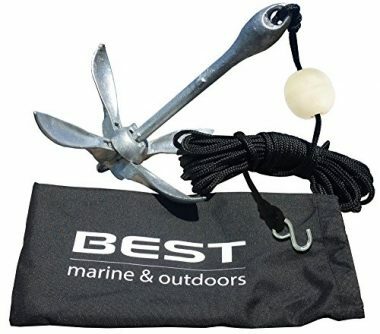 For those looking to take their kayak into deeper waters when this might be the anchor that you are looking for as it comes with a whole 50 foot of rope length. That rope comes in an illuminous color which will be easy to spot in low light. It comes in sizes of 1.5 or 3.25 depending on your needs and also comes with a drawstring storage bag. This anchor will easily store away in your kayak and is also very easy to use. It’s made out of galvanized iron so you don’t have to worry about it rusting and has a 40-foot rope. It weighs 3.5 pounds and this is an anchor that is going to keep you secure in almost all circumstances. It also comes with one year guarantee which will give you peace of mind on its build quality. This is another anchor that doesn’t come with an additional extras which is great if you have your own already. 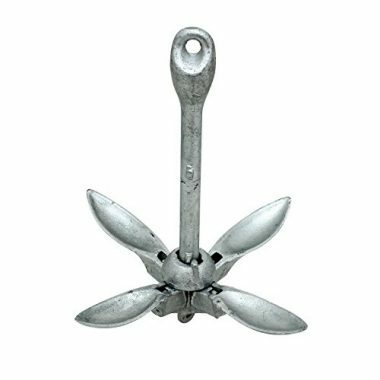 It has a folding anchor which is easy to store and has a galvanized finish which will prevent rusting. This is perfect for any small boat and will leave you assured that your kayak won't drift away. When anchoring your kayak, you need to consider where you want the anchor to hang from. 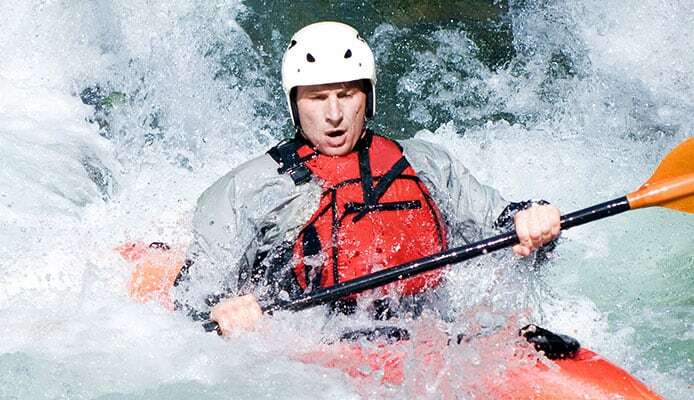 Ideally, you want to attach it to either the front or back of the boat as due to the narrow profile of a kayak, you want to be facing downstream and not sideways and therefore not into the waves. 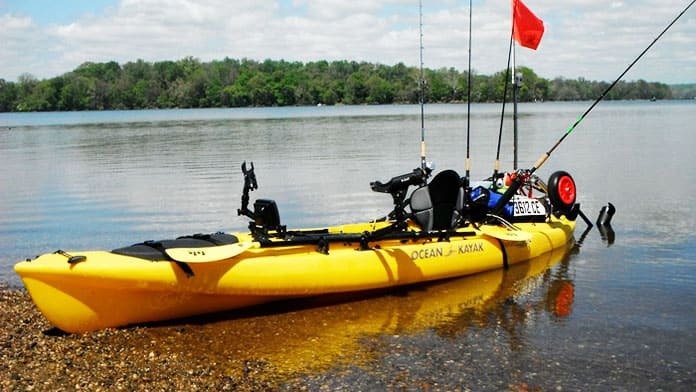 You can also use an anchoring system to move your kayak from front to back, however, this requires a more complicated mounting system. If you don’t have the suitable points on your kayak, then you can add this yourself or pay an outfitter to install it. 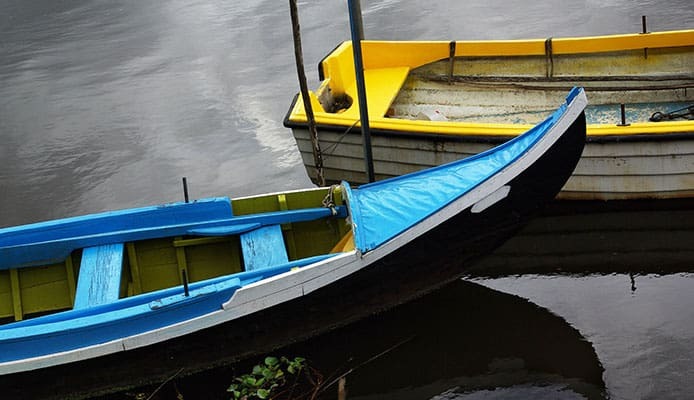 Most kayaks should have suitable points where you are able to cast an anchor from, but if not, then you’ll have to add some mounting plates to your boat. Remember that it’s best to have your anchor from either the front or back of the boat. 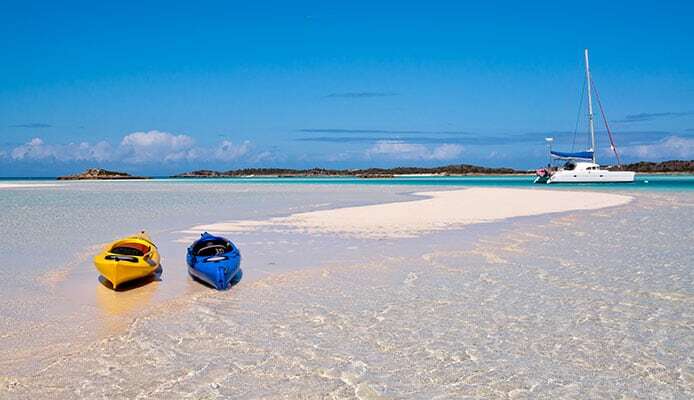 Most kayaks though will come with suitable anchoring points and rope systems, so if you’re buying a kayak from new, make sure you look out for this. 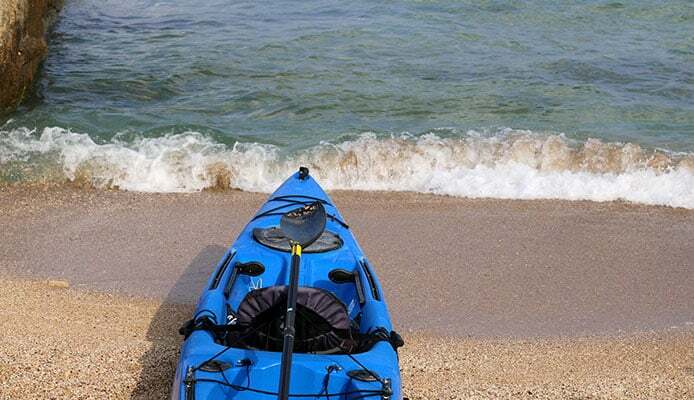 If you’re looking for an alternative to an anchor and simply want your kayak to move slowly along then buying a drift chute would be useful as they are easily deployed into the water and will slow you right down to a crawl. 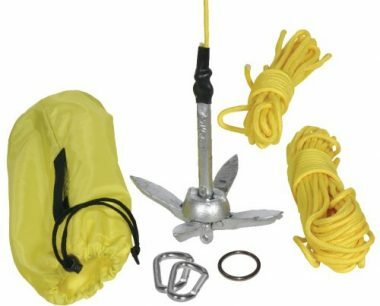 This is effectively a parachute that you place in the water and works in exactly the same way, naturally, they are quicker and easier to deploy than a traditional anchor. Rope length is one of the most important aspects of buying or using an anchor as you need a lot more rope than the depth of the water you’re traveling on. The reason is that the anchor needs to lie on its side so the wings can dig into the bottom. When looking at a rope, you need it to be around seven times longer than the depth of water you’ll be on. If not, then you’ll be endlessly frustrated as your anchor drags along the bottom of the water without ever holding. Q: How to anchor a kayak? A: Paddle to the position that you want to anchor yourself in, and then open the flukes of the anchor making sure that they are securely locked in. Cast it safely away from yourself and wait for it to sink to the bottom. When it does, pull it toward yourself and allow the line to run to its full length and once you have a secure anchor, securely tie it to your kayak, double-checking your knot before you let go. Q: How to attach an anchor to a kayak? A: If your kayak has an anchoring system, then this can be very useful in making it as easy as possible for you to anchor yourself from your seat. Otherwise, just clipping your anchor to the front or back of the boat is easy enough, but you want to ensure that you have a secure knot, such as a figure-eight knot. Running your rope through a cam cleat will give you more control over the rope and allow you to gradually release it. Q: What does a kayak anchor trolley do? A: If you’re using a kayak in order to fish, then you’ll want to use a kayak anchor trolley system. This will allow you to change the position of your boat depending on such things as wind direction and tide. It’ll mean that you don’t have to use multiple anchor cleats and will give you a great range of flexibility. 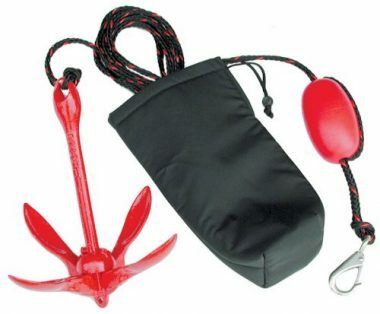 They are compatible with most anchors and will stop you from getting frustrated on the water. Having a secure anchor is essential for your kayak, as even if you don’t intend to stop at any point, there are situations that might call for it. All the anchors we reviewed here have the same kind of anchoring system, but it’s important to pick the right kayak anchor weight and the right kayak anchor rope length for you. 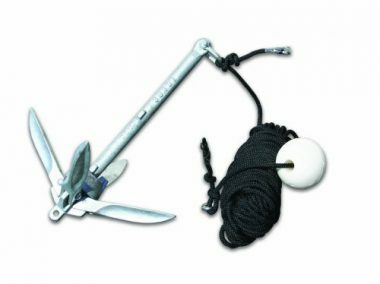 Some of these products come with a great kayak anchor kit which can be useful if you need a whole system, whereas others just simply have the anchor if that is all that you require. If you’re kayaking in deeper waters when you’ll want a long rope length and a heavier anchor, but a well-made anchor should be effective for any kayak between 3 and 3.5 pounds. 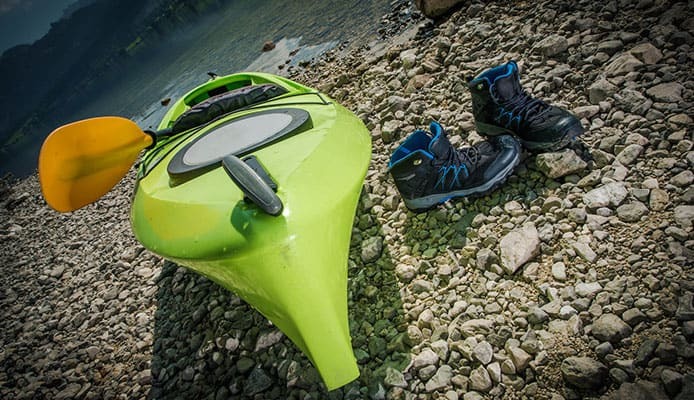 Sometimes it can be a personal choice, so make sure you read through the buying guide and check your kayak to make sure that you’re going to get an anchor that will be a great fit for your kayak. When you so, you’ll be able to fish, swim or relax in your kayak safe in the knowledge that it won’t start drifting away.